The BRC 2017 autumn count is a season of anniversary for which we receive many surprises! After getting 4 Eleonora’s Falcons, which is a higher total than all Eleonora’s we got since 2008, and the 1st Pallas’s Gulls actively migrating, an experienced counter of the team, John Wright, spotted on the 17th of September a European Honey Buzzard with an unusual shape during a day of slow migration. After taking pictures, a quick examination revealed very promising moult pattern. 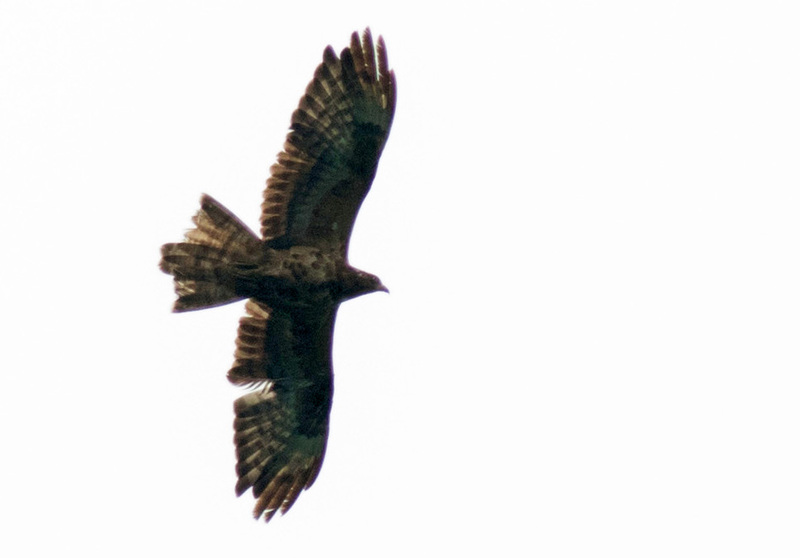 The European Honey Buzzard Pernis apivorus is the most common raptor species migrating through Batumi bottleneck, with an average of 520.000 individuals counted per autumn. Peak-days regularly reach the bar of 100.000 birds. The record peak-day for the BRC is even higher, with an unforgettable 179.342 Honey Buzzards counted on 3rd September 2012. So why do we show so much enthusiasm for a single of these birds? It appears that all Honey Buzzards spend their first year(s) of life in Africa. This long-distance migrant comes back to Europe once it reached the age of breeding. Despite this general rule few exceptions exist. There are a couple of known spring records here and there around the Mediterranean basin and some discussions about them (see Corso 2012, Pannucio and Agostini 2012). To our knowledge there are no claimed records of immature European Honey Buzzards in autumn, or at least no documented ones. This picture taken by Dr John is a rare opportunity to give a close look at what Honey Buzzards look like during the autumn of their 2nd calendar year. First, the global appearance of the bird is striking because flight feathers show a clear contrast between worn and abraded juvenile feathers and freshly moulted adult-type feathers (detailed in Forsman’s book). This is totally unusual for autumn Honey Buzzards, unless you observe a bird with a damaged plumage. 2cy Honey Buzzard, Batumi, 17th September 2017. Photo by John Wright. Another view of the bird showing the different feather generations. Here are examples of juvenile birds with damaged plumage that can be mistaken for 2cy birds if not watched closely. They show what is called fault bars, which are gaps in feathers that originate because of a lack of nutrition at the time that part of the feather was formed. The lack of nutrition during growth causes the barbs in that part of the feather to be very weak, such that quickly abrade, giving the feathers a strange appearance. Juvenile Honey Buzzard showing fault bars, Batumi 2012. Photo by Aki Aintila. Juvenile Honey Buzzard, Batumi 2012. Photo by Maël Sinoir. The wing flight-feathers show various moult progress. Primaries show freshly moulted P1-5 and growing P6, while P7-10 are juvenile type. The juvenile outer fingers show a sharp contrast between dark fingers and white basis of the feather, which is a good tip to separate juveniles from tricky juvenile-like females. The pattern of newly moulted primaries suggest that the bird is a female. These feathers show a dark trailing edge combined with 3 rather broad bars spread across the feather, the outermost bar being close to the dark tip of the feather. Secondaries are mostly of juvenile type, except the outermost of the right wing and the 2 outermost of the left wing which are freshly moulted. 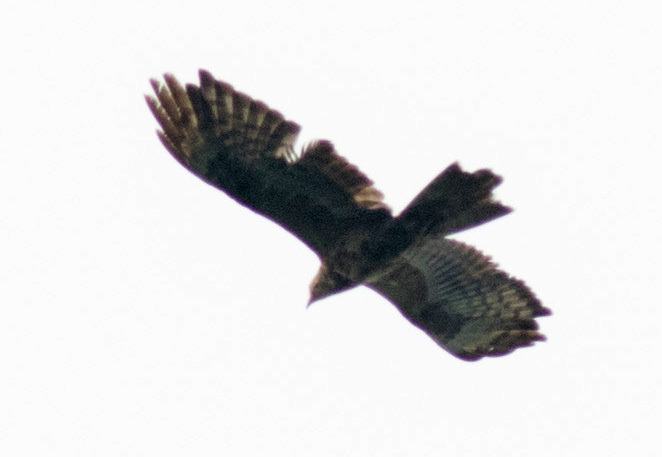 The juvenile type secondaries are typical of young Honey Buzzards, showing a bulging shape, being dark and showing 3 evenly spaced broad bars, lacking the dark trailing edge that most adults show. The tail shape is also rather unique, with fresh inner and outer tail-feathers contrasting with pale brown juvenile feathers which are shorter because of abrasion. The new tail-feathers pattern is also in favour of a female bird, with a dark tip less solid than in males combined to 2 brown bars. The head and upper breast are moulted, contrasting with the light brown belly and underwing coverts where few feathers are fresh, giving a mottled aspect to the bird. The iris was a dull yellowish-ochre and not as clean and bright as an adult and the bill was generally dull grey apart from a hint of pale yellowish at the base. Let’s hope this record will bring some more attention on immature plumages of Honey Buzzards! Corso, A, Pannucio, M & N. Agostini. 2012. The status of second-calendar-year Honey-Buzzards in Europe. British Birds 105(8): 484-486. Forsman, D. 2016. Flight Identification of Raptors of Europe, North Africa and the Middle East. Bloomsbury.